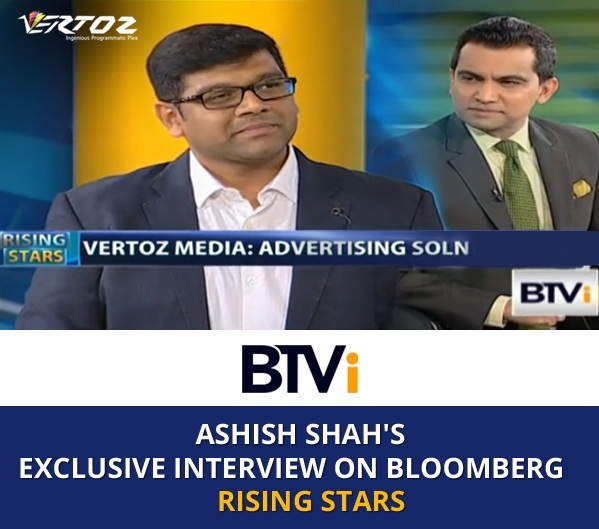 During Bloomberg’s Rising Stars interaction, Vertoz CEO, Ashish Shah shared thoughts on how it all started from a small initiative to the birth of a successful online advertising business – Vertoz. Vertoz is a programmatic platform where it works with the pool of advertisers and publishers, all under one roof. Vertoz creates a nexus and connects both the advertisers- DSPs and publishers- SSPs on an RTB enabled platform. Vertoz is among the leading programmatic companies that offer engaging and innovative advertising and monetization solutions. In this interaction, Ashish mentioned that, in the year, 1998 he launched a website called IndiaFreeMail.com. The idea behind it was to deliver free postal mail from people located across the globe to their families in India. Before this, delivery of regular international postal mail used to take approximately 40 to 45 days, however, IndiaFreeMail.com used to take only 8 days. However, they could not predict the market and failed miserably. But, Ashish perused the idea of online advertising and started the venture Vertoz in the year 2012. Through his years of learning, they have built strong experiences and have launched several technology businesses under their parent company Trunkoz Group. Vertoz is a leading programmatic company that offers engaging and innovative advertising and monetization solutions. Vertoz ensures that the ad reaches the right audience and are targeted across websites and apps for our advertisers. Vertoz monetize inventory from all verticals and geographies to ensure the best ROI for our publishers. Vertoz’s Ingenious Plex, proprietary technology and advanced capabilities empower a global roster of top advertisers and publishers all under one roof. Bloomberg TV India is India’s premier business news channel that focusses on business news and policy. It has a segment ‘Rising Stars’ focusing on younger players and the new gamechangers in the space of business. The channel features path breaking programming that focuses on delivering cutting edge analysis by a wide range of experts. Bloomberg India TV is part of the Bloomberg, the world’s largest finance news network.